2018 was a great year for Hearthstone Esports. Earlier this month Team China upset tournament favorite Brazil in the Grand Finals of the Hearthstone Global Games at BlizzCon. We’ve crowned two seasonal champions at our Summer and Fall Championships. We’ve seen more than 200,000 players attend 25 Tour Stops and other major events across the globe. And by the end of the Year of the Raven we’ll have awarded more than $2.8 million in prize money—our largest amount ever. Along the way, we’ve gathered feedback from players and fans. We’ve learned that many of you feel the HCT system can be challenging to follow, not as accessible to new players as it could be, and unsustainable for pros. Today we are excited to share with you a preview of our plan for continuing to make Hearthstone esports the best it can be for viewers and competitors alike. 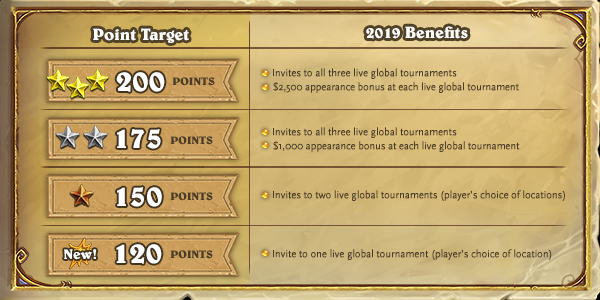 The Hearthstone Championship Tour (HCT) as we know it will go out with a bang this coming spring with the HCT World Championship, where the best Hearthstone players in the world will duke it out for $1,000,000 in prizing. Throughout the year, in conjunction with a third-party platform partner, Hearthstone Esports will run hundreds of qualifier tournaments, primarily online. The first of these will start in the spring, and they will not be region-locked: anyone from anywhere will be able to compete at a time that works for them. Winning a qualifier grants you entry to the next tier of competition. In 2019, we will hold three invite-only tournaments around the world, with more planned for 2020. These live events will see our best and brightest Hearthstone players—from household names to aspiring pros who spiked their first tourney—compete for $250,000 per event. Best of all, success here will open the door to the ultimate level of competition. The top tier is a seasonal round-robin online competition, split into regional divisions, featuring the best and most compelling Hearthstone players in the world. It will begin after the HCT World Championship and climax with an epic finale at year’s end. Players who participate in this competition receive performance-based bonuses, as well as automatic invites to all the live global events in the previous tier. We look forward to sharing more details soon about this level of play, including how players will join the competition in its inaugural year. Our goals are for Hearthstone esports to be sustainable, entertaining, and accessible for all. As part of this, we will retire the Conquest format in 2019. Fundamentally, we want Hearthstone esports to better reflect the in-game experience, as well as be easier to grasp for new viewers. This new format, to be unveiled in the coming months, will be played across the ecosystem. This year, the Hearthstone Masters System was created to recognize top players based on the consistency of their performance, with rewards pegged to Competitive Point totals from the previous three seasons. 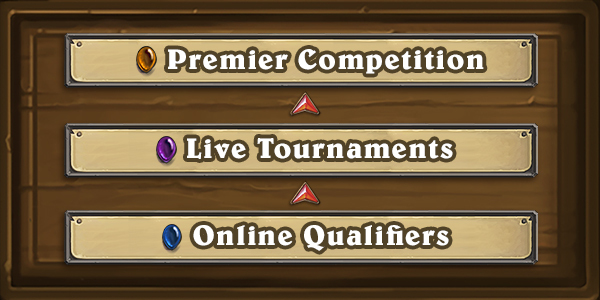 Many of you have been working toward these achievements—and so, while Hearthstone esports will change significantly in 2019, we will ensure that those who would have achieved Masters status earn rewards of equal or greater value. During this period players can earn points at Tour Stops, the HCT Winter Playoffs, and the HCT Winter Championship, but not on ladder. See the rules for full details. Thank you for reading! We look forward to hearing your feedback about the broad outlines of this new system. And, rest assured: in the coming months we will meet with players to answer questions and address concerns. We want everyone to be accounted for in this long-term vision, from casual fans to the most dedicated pros. This is the next evolution of our promise to make Hearthstone esports sustainable—and enjoyable!—to all those who enter the tavern.